Featuring Restaurants and places to eat in the Poconos Mountains of PA. with detailed reviews of top Poconos Mountains restaurants written by our editors and visitors, as well as reviews of every type of cuisine and recommendations of great places to eat in all four counties. Also check out our gourmet guide , our guide to dining on a budget, and our Best of the Poconos Restaurants guide! Bet you had no idea that there was a vibrant restaurant scene in the Poconos? There is. BUT, like getting to most of the best things to do in the Poconos, you'll have to drive a little distance. Our reviewers travel the entire 2400 square miles of the Poconos Mountains to find you the best places to eat. What you'll find below are not advertisements like some Poconos Dining Guides or like you might find in the Visitors Bureau's web sites. Here are our local restaurant customer's reviews and dining opinions. Enjoy your night out at one of our Local Poconos Restaurants. The Top 5 Tables in The Poconos - Where to go, where to sit and who you'll see at the 5 top Pocono Mountain restaurants. You'll want to read this before making those dinner reservation! 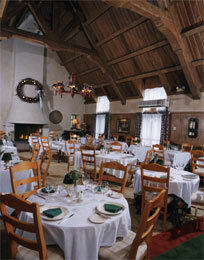 Poconos dining is from casual to elegant. Make dinner reservations prior to your arrival (best to do it when you make your hotel reservations) during most seasons. The Sycamore Grille Main and Oak Streets, Delaware Water Gap PA,. Best New Restaurant in the Poconos Basso Cucina Italiana M Restaurant & Wine Bar on Route 390 in Cresco, PA. 570-595-0500 The Pipolo Family has renovated the space that was Harrison's Bar. With Chefs Gracie (formerly of Gracie's in East Stroudsburg and George (lastly Alaska Pete's) . Sucj Italian as you've never had before. The space has a distinct Italian feel, and both Gracie and George do wonders with a small kitchen. This is bound to be winner for years to come. There is a late night bar menu from 10 -12 a.m! Wine is available. The desserts are homemade! Peppe's Ristorante Eagle Valley Mall Rts 209 and 447, East Stroudsburg, PA Enjoy the traditions of Northern Italy in a place where attention to detail, seasonal fresh foods, and the warmth and ambiance surround you. Peppe's Ristorante, the Poconos premier Italian Restaurant proudly celebrates over 30 years of fine dining. Committed to offering you world class Italian cuisine, unparalleled service and a comfortable, pleasant atmosphere Peppe's makes you feel right at home. Alaska Pete's Rt 209 North of the Marshalls Creek Exit (#309) of Rt I-80 In the mood for some wonderful food? At Alaska Pete's they pride themselves on the great staff and service that is second-to-none! From the large salad bar, to the delicious steaks, they do work hard for you. In the mood for a quick burger? They have them along with many other "quick bites". Did we for-get to mention the fresh fish with emphasis on King Crab Legs? Alaska Pete's prides itself with all fish cooked up fresh, seasoned and served to fulfill your apetites. The Steaks are among the area's best also. All at resonable prices. Saen - Thai food -in the Shawnee Shopping Center, Buttermilk Falls Road and River Road , Shawnee , PA Great tasting, high quality food in a fun and friendly atmosphere, for people who crave a quality dining experience. At Saen Thai Cuisine, you can come and relax with family and friends or you can come in an grab something to-go. A small dining room (about 20 tables) means you'll have to go early or late or wait. But, it will be worth it. 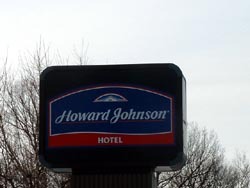 Personal service from the owner most nights. 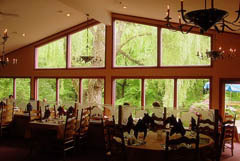 We hope you will have fun and enjoy eating at one of these Poconos Restaurants. Poconos Restaurant reviews are by local Poconos residents and are their opinions.